Havanese Club of Southern California Specialty under Judge Elizabeth ("Lani") McKennon, presented by co-breeder/owner Taffe McFadden. Born: September 6, 2014 Height: 10-1/4"
Vivien is a vivacious show girl, who lives up to the reputation of her dam line as flirty, joyful girls. Vivien's "Hollywood style" and flashy good looks made judges take note, and she finished her championship very quickly. 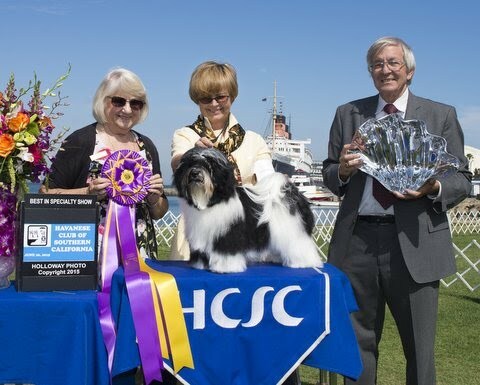 Her first time shown as a special, at 10 months of age, Vivien was awarded Best in Specialty Show at the Havanese Club of Southern California Specialty in June, 2015. This Best in Specialty Show award was special in its own right, but doubly special to us as Feliz' dam was awarded Best in Specialty Show at the same event in June, 2013. Vivien, born to the "Hollywood Legends" litter, was named for Hollywood star Vivien Leigh, and is a litter sister to Ch. Oeste's Always Flirt'n with You ("Ginger").